What was once a destination for immigrants arriving in America and later, the hub of gritty New York City, is today one of Manhattan’s trendiest neighborhoods. Visitors will find unique boutiques, small galleries and plenty of character in this part of New York that’s bordered by East Houston, Essex, Canal Street and the Bowery. 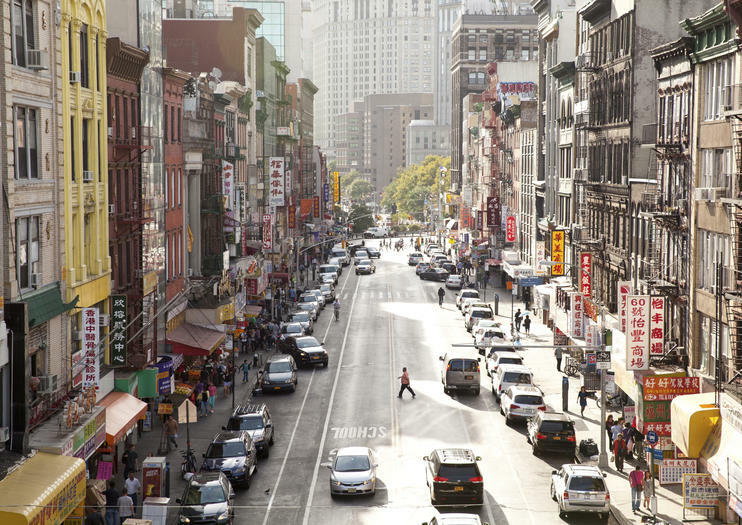 Travelers venturing into Chinatown, NoLita, SoHo and the East Village should be sure to add a stroll through the Lower East Side to their itinerary. Known by locals as Loisaida because of its large Spanish-speaking population, this neighborhood is home to plenty of Latin-influenced cuisine. But travelers will find plenty of diverse flavors, including the iconic Katz’s Delicatessen, made famous in When Harry Met Sally. Travelers who want to take a look at Manhattan’s earliest inhabitants can check out the Tenement Museum, which showcases the life of the city’s earliest immigrants. Art lovers can find galleries and live music venues scattered across Ludlow and Orchard Streets. And since a number of trains, including the B, D, F, J and M—as well as local buses—make stops in the Lower East Side, travelers will find it easy to access, though, since streets here aren’t numbered, possibly more challenging to navigate. Manhattan's Lower East Side is accessible using several subways, including the F, M, B, D and J trains. The M15 bus also travels along Houston street and makes traveling to and from anywhere on Manhattan's East Side a breeze. Admire the architecture of Manhattan from the water on a cruise on a 1920s-style yacht. From the teak deck of the boat, learn about New York City's architectural landmarks as you circumnavigate the island and listen to the 'Around Manhattan' narration, provided by members of NYC chapter of the American Institute of Architects (AIA). Both locals and visitors will find the commentary interesting. One beer or glass of wine is provided, as well as snacks and soda. See New York City shine in all its glory on this illuminating, 1.5-hour night tour. From aboard an open-top double-decker bus, see the lights and evening activity of Times Square, Greenwich Village, SoHo, the Rockefeller Center, the Empire State Building, and more. You'll savor incredible panoramic views of the Manhattan skyline at night. Explore the food and history of the Lower East Side on a small-group 3-hour walking tour. Stop at seven mouth-watering food destinations for tastings and take in the neighborhood's rich history as you pass by the Tenement Museum and other landmarks. Your local guide shares stories about this famous part of Manhattan as you stroll at a leisurely pace. You'll have plenty of time for tastings at legendary spots that serve up both sweet and savory treats, including knishes, bialy, and pickles. Explore the nightlife of New York City on a tour that guarantees skip-the-line access at a minimum of 4 venues. You might visit a bar, speakeasy, live music hall, rooftop lounge, or dance club depending on what’s available that evening. Travel with a small group and guide who provides free admission and 2 complimentary drinks as you meet new people during this worry-free night out in New York. Enrich your understanding of New York as a city of immigrants, exiles, and refugees on this walking tour of the Lower East Side. With an informative guide leading the way, learn about the African burial ground beneath the city’s pavement, the Italian slum of Mulberry Bend, the Five Points neighborhood of “Gangs of New York” fame, and the waves poor immigrants who called this corner of lower Manhattan home. Learn about wine from a trained sommelier, and discover delicious highlights of the Lower East Side, on this small-group tour. Meet your guide in the afternoon, and be sure to come hungry: you’ll visit two well-rated local restaurants, where you’ll enjoy numerous dishes, plus four total glasses of wine. Then, continue to a wine shop, where you’ll sample two more wines and will have a limited-time discount on bottles. As you go, learn from your sommelier guide about blind tasting techniques, food and wine pairings, and more. Traverse New York City's streets like a local on a bike tour of Lower Manhattan. Pedal along as your guide navigates the city’s numerous bike paths and side streets to the Brooklyn Bridge, Wall Street, New York Harbor, and beyond. Learn about Manhattan’s top sights as you pedal through iconic neighborhoods, such as the Lower East Side, Greenwich Village, and Battery Park. Experience the flavors of New York City’s Lower East Side on a 3-hour culinary walking tour through a vibrant and historic neighborhood. Explore the area with a food-loving guide, and learn the history of the immigrants that gave the Lower East Side its diverse, rich cuisines. Pause for tastings at six shops, restaurants and cafes, and enjoy tastings at each destination. Sample traditional Jewish delicacies and old-fashioned candies as well as creative donuts and sweets in a neighborhood packed with galleries, boutiques and local charm. Learn the shocking truth behind New York City’s organized crime rings on this guided, 2.5-hour tour. Led by a retired New York City police officer or detective, visit locations with a history of crime both past and present, like Chinatown, the Lower East Side and Wall Street. Find out about New York’s sordid past and how the city was shaped by crime — crime rings, gang crimes, the mafia and more. It’s a fascinating account for anyone interested in true crime and the stormy past from one of the world’s most famous cities. New York’s East Village is a cultural melting pot of the classic and the contemporary. Enhance your experience of the Big Apple’s hippest neighborhood on this 3-hour walking tour including food tasting. Alongside your guide, you’ll visit cultural and culinary hot spots including the gentrified St. Mark’s Street, Café Veselka, and McSorely’s, the oldest Irish pub in East Village. Pleasure your palate with five food samples and receive personalized attention from your guide on this small-group tour, limited to 15 people. New York’s vibrant Lower East Side neighborhood has, in recent years, become a hub of some of the city’s most experimental and boundary-pushing street art. Go on a small-group, cultural walking tour of the neighborhood, and spot noteworthy works by internationally renowned artists. Meet your guide at the Houston Bowery Wall in Nolita—famed for its ever-changing murals—and then venture to the LES. You’ll admire pieces in the 100 Gates Project, will see work by Shephard Fairey and Space Invader, and learn more about the vibrant local street art community. Enjoy unobstructed views of NYC with this hop-on hop-off bus tour and ferry. Travel by double-decker bus and explore the streets of Manhattan, including Uptown, Downtown and Brooklyn. With more than 40 stops around the city and three harbor ferry stops, you can design your own itinerary and set your own pace. Tickets are valid for 48 hours. Bonus: Museum of the City of New York admission is included! For more value, opt for the VIP Pass which upgrades your pass so you benefit from skip-the-line access or add one attraction to your your tour. Tour New York City in a new and fun way with this private tour in Jeep Wrangler. With your expert local guide by your side, cruise the streets of the Big Apple in a new Jeep seeing famous neighborhoods like Greenwich Village, SoHo and the Lower East Side. This tour has a maximum of just four participants. Hop in a vintage taxi cab and discover the flavor of a classic New York slice on a private tour through Manhattan’s unpretentious, highly-rated pizzerias. With stops at up to 6 establishments loved by locals, the tour is a popular choice for foodies and pizza newbies alike. Along the way, your guide teaches your group about what makes each slice special, from technique to ingredients. Discover New York City with a private guide on a full-day tour that explores the glitz and grit of Manhattan. Ride the subway and walk through distinctive neighborhoods including Chinatown, Little Italy, Greenwich Village, and the Lower East Side. See Times Square, Wall Street, Rockefeller Center, Fifth Avenue, the World Trade Center, Central Park and more on this comprehensive city tour. If you’re not familiar with NYC, going out at night can seem pretty intimidating. This NYC nightlife tour puts your mind at ease by planning out your night for you. You’ll be led by a guide who knows the downtown area better than most and who’ll take you to at least four hip venues. Get special skip-the-line entry at each location and two drinks included in your night out in New York City. Explore the history and culture of New York City’s Lower East Side on a 2.5-hour gourmet walking tour starting with NYC’s most iconic food—a fresh bagel. Follow your guide to bakeries, delis, candy shops and markets that celebrate the Lower East Side’s Jewish heritage, and enjoy snacks and drinks along the way. Visit synagogues, museums and local landmarks to hear stories about daily life and traditions in this colorful New York community. Travel back in time to the Roaring Twenties as your tour guide makes the past come alive. You will visit Lower East Side pubs that served as speakeasies during Prohibition along with other hidden bars. You will have boozy fun learning about this fascinating chapter of American history. Experience what was converted from an old second-floor bank run by corrupt gangsters. See just what lies behind a real pawnshop. Say the password through a peephole to gain entrance to a real speakeasy from the Prohibition era owned by one of the more infamous gangsters in American history. Learn about who some of the colorful characters were—the gangsters, entertainers and madams alike—who brought the crowds in and kept the parties rolling right under the authorities noses as you move from one pub to the next with nary a hint of scandal. It will be the Bee's Knees! Savor a taste of New York during this 11-hour, small-group walking tour focusing on eating and exploring in the Big Apple. Join no more than 12 guests as you learn the history and present incarnations of neighborhoods like Midtown, the historic Lower East Side, East Village, Chinatown, Little Italy and more. Along the way you’ll sample a range of included snacks, craft beer and cocktails. Explore the rich culinary history of the Lower East Side on this private half-day walking tour. With an informative local guide leading the way, learn about the waves of immigrants who settled this once impoverished strip of tenement houses. Visit some of the neighborhood’s landmark restaurants, delicatessens, and appetizing shops, including Katz’s, Yonah Shimmel’s Knish Bakery, and the Pickle Guys. Get to know the East Side on a private walking tour of the area’s most iconic neighborhoods, from St. Mark’s Place to Chinatown. Booking a private tour ensures the full attention of your guide, who eliminates the hassle of navigating the busy street of Manhattan on your own. Over the course of the afternoon, learn about the East Side's rich history as you sample treats from authentic eateries. On this private tour, get up close and personal with the Lower East Side: one of Manhattan’s most diverse and dynamic neighborhoods. Pick a departure time that works for your schedule, and meet your guide. You’ll see the Eldridge Street Synagogue, popular eateries like Katz’s Deli and Russ & Daughters, the Manhattan Bridge, and more. As you go, learn about the immigrants who shaped the area, the history of tenement housing, the Lower East Side’s rich culinary culture, and more. Get to know two of New York’s most characterful neighborhoods, and experience two tours in one, when you sign on for a tenement tour of the Lower East Side and a brewing tour of Williamsburg. Both tours are rooted in history, and explore the experiences of immigrants who shaped New York. Start your full day of adventuring in City Hall Park in Lower Manhattan. Over the course of the day you’ll visit numerous historical monuments, will sample plenty of local craft beers, will enjoy a classic New York pizza meal, and more.